Green-Wood Cemetery’s Civil War Soldiers’ Lot. Memorial Day, originally called Decoration Day, honors United States’ armed services personnel killed during wartime. The Memorial Day was first formally observed on May 30, 1868 to honor the soldiers killed during the Civil War. General John Alexander Logan of the Grand Army of the Republic, an organization of Union Army veterans, issued an order that the day be observed “for the purpose of strewing with flowers or otherwise decorating the graves of comrades who died in defense of their country during the late rebellion.” Thus, the day earned the name Decoration Day. Green-Wood Cemetery, near its Historic Chapel. 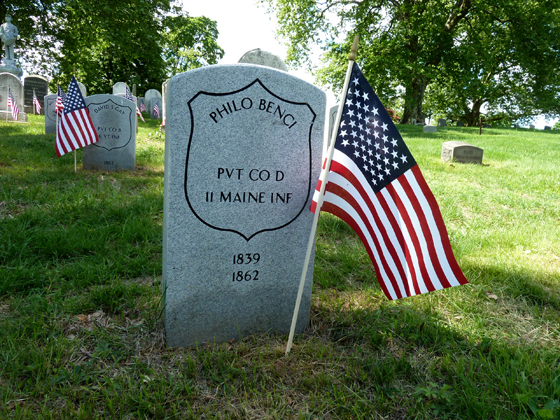 In 2008 Green-Wood Cemetery unveiled two new, pale-gray granite Veterans Administration-issued gravestones for the Prentiss brothers; they serve as legible testimony to the Maryland brothers who lie beneath. The elements have worn away and made unreadable the marble 19th-century gravestones that stand just behind them. The new gravestones are made of granite, a much more hearty material that will withstand the elements. 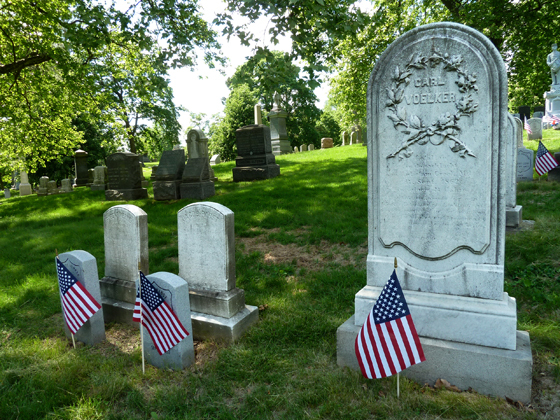 Green-Wood Cemetery’s Civil War Project was begun in 2002. Over the past 12 years, through the Project’s efforts, 4,800 Civil War veterans, who are interred at Green-Wood, have been identified. The Project has written biographies for each of these men; it has located each of their graves within the cemetery; and from the Veterans Administration Green-Wood has received 2,000 gravestones to mark the graves for those who have rested for many years in graves that were unmarked. 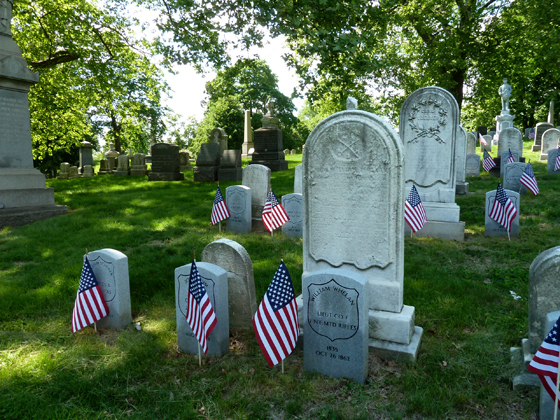 Sixteen Union generals, including Henry Halleck, Henry Slocum, Abram Duryee, and Fitz-John Porter, and two Confederate generals are buried at Green-Wood Cemetery. Approximately 130 fallen Union soldiers, including men who died at Shiloh, Antietam, and Gettysburg are interred in the shady Civil War Soldiers’ Lot at Green-Wood. 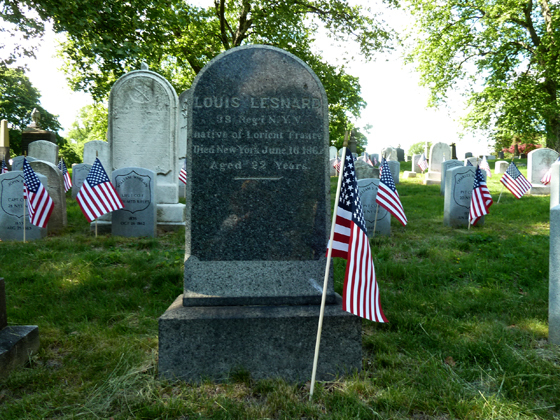 Green-Wood Cemetery’s shady Civil War Soldiers’ Lot. A surprising find: the headstone (above) of a native-born Frenchman, Louis Lesnard from Lorient, France, who fought and died in the U.S. Civil War from New York State. It is especially instructive to read the comment by the Confederate soldier at the end and to remember how they perceived their cause. The quotes of the Confederate officers—Lieutenant General John B. Gordon, CSA (1832–1904) and Major General Patrick Cleburne C.S.A. (1828–1864)—were included exactly for the reason of contrast to long-held Northern beliefs by offering the Southern point of view.